It’s a rainy day and I’m feeling lazy so I felt like ordering a pizza. I wanted something cheap and fast, so I chose Domino’s. I haven’t had their pizza in a while and I felt like they deserved another shot. I went to their website and saw that they’ve elaborated their online ordering. It makes it really easy to build and customize your pizza. There’s a virtual picture of your pizza that displays your toppings so you can see what the pizza will actually look like. You can see if pepperoni and bacon looks better than sausage and mushrooms. 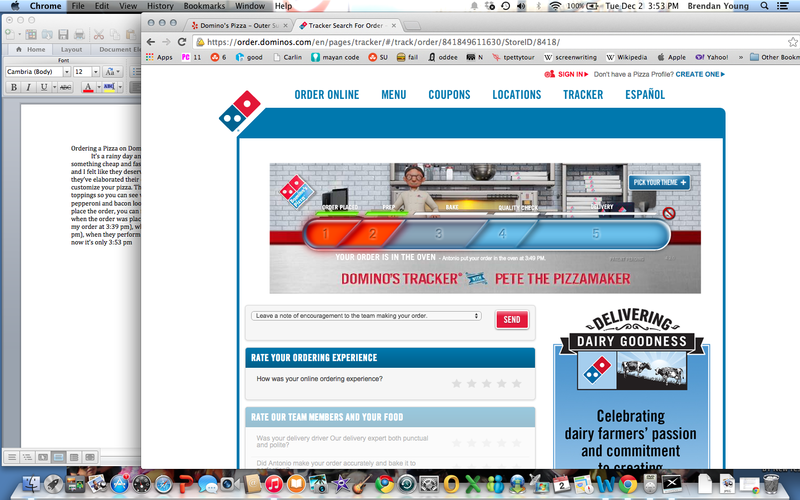 As soon as you place the order, you can follow the action with the Domino’s Tracker. It tells you when the order was placed, when they started prepping it (Antonio started making my order at 3:39 pm), when they started baking it (Antonio put it in the oven at 3:49 pm), when they perform the quality check, and when they start to deliver it. Right now it’s only 3:53 pm so I don’t know if the pizza tastes good or not, but I’m pretty impressed with ordering a pizza from Domino’s online. I will definitely do this again.